If you’re looking for a drink with all the health benefits of tea, a similarly great taste, but no caffeine, look to South Africa! Rooibos is made from the South African red bush (Aspalathus linearis). Using rooibos instead of tea is a great way to enjoy a caffeine-free hot (or iced) drink without using any chemical decaffeination process. Rooibos is full of antioxidants, Vitamins C and E, iron, zinc, potassium, and calcium. It is naturally sweet without adding sugar. Rooibos grows only in the Western Cape of South Africa, and a similar plant called honeybush (the Cyclopia plant) grows in the Eastern Cape. Its flowers smell of honey, hence the name. The taste of honeybush is similar to rooibos, though perhaps a bit sweeter. Like rooibos, honeybush is naturally free of caffeine and tannins; perfect for a late-evening drink. South Africa, as the name implies, sits at the very southern tip of the African continent. It completely surrounds a small country called Lesotho. South Africa covers 471,443 square miles (about three times the size of Montana) and has a population of 51,770,000 (a bit more than Spain). Despite wide open spaces in the middle of the country, the large cities make it overall densely populated. The country has the largest economy in Africa, yet about 1/4 of the population is unemployed and living on the equivalent of US $1.25 per day. Rooibos isn’t a huge part of the South African economy. It does, however, employ about 5,000 people and generates a total annual revenue of around US $70 million, which is nothing to sneeze at. The plant is native to South Africa’s Western Cape, and the country produces about 24,000,000 pounds of rooibos per year. 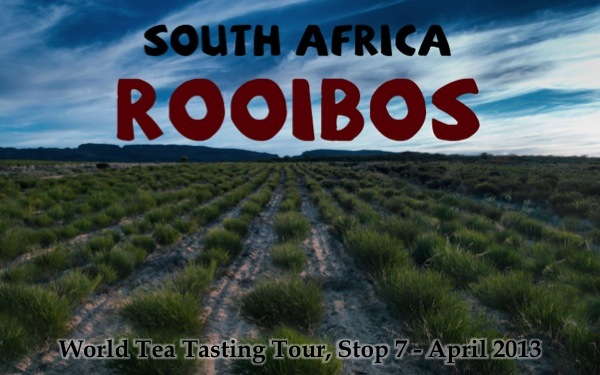 The name “rooibos” is from the Dutch word “rooibosch” meaning “red bush.” The spelling was altered to “rooibos” when it was adopted into Afrikaans. In the U.S., it’s pronounced many different ways but most often some variant of ROY-boss or ROO-ee-bose. I’ve written quite a bit about red rooibos in several posts — and about the copyright issues — so I won’t repeat it all here. Rooibos is also great as an ingredient in cooking: see my African Rooibos Hummus recipe for an example. Green rooibos isn’t oxidized, so it has a flavor profile closer to a green tea than a black tea. Again, I’ve written a lot about it, so I’ll just link to the old post. Honeybush isn’t one single species of plant like rooibos. The name applies to a couple of dozen species of plants in the Cyclopia genus, of which four or five are used widely to make herbal teas. Honeybush grows primarily in Africa’s Eastern Cape, and isn’t nearly as well-known as rooibos. It got its name from its honey-like aroma, but it also has a sweeter flavor than rooibos. It can be steeped a long time without bitterness, but I generally prefer about three minutes of steep time in boiling water. I decided to bring out a couple of flavored rooibos blends for the tasting as well. The first is Jamaica Red Rooibos, a Rishi blend. It has an extremely complex melange of flavors and aromas, and is not only a good drink, but fun to cook with as well (see my “Spicing up couscous” post). BlueBeary Relaxation one of the blends in our Yellowstone Wildlife Sanctuary fundraiser series (the spelling “BlueBeary” comes from the name of one of the bears at the Sanctuary). It’s an intensely blueberry experience that’s become a bedtime favorite of mine. It’s like drinking a blueberry muffin! To make a really good cup of iced rooibos, prepare the hot infusion with about double the leaf you’d use normally, because pouring it over the ice will dilute it. Both green and red rooibos make great iced tea. I prefer both styles unadulterated, but many people drink iced red rooibos with sugar or honey. This South African take on the “London Fog” is a great caffeine-free latte. To prepare it, you’ll want to preheat the milk almost to boiling. If you have a frother of some kind, use it — aerating the milk improves the taste. Steep the red rooibos good and strong, and add a bit of vanilla syrup or extract. We use an aged vanilla extract for ours. Mix it all up, put a dab of foam on top if you frothed the milk, and optionally top with a light shake of cinnamon. This was the seventh stop on our World Tea Tasting Tour, in which we explore the tea of China, India, Japan, Taiwan, England, South Africa, Kenya, and Argentina. Each class costs $5.00, which includes the tea tasting itself and a $5.00 off coupon that can be used that night for any tea, teaware, or tea-related books that we sell. Posted on 7 April 2013, in Styles & Blends and tagged Aspalathus linearis, BlueBeary, blueberry rooibos, caffeine, Cape Town Fog, couscous, Cyclopia, Eastern Cape, green rooibos, hibiscus, honeybush, iced rooibos, Jamaica Red Rooibos, London Fog, red rooibos, rooibos, rooibosch, South Africa, tannins, Western Cape, Yellowstone Wildlife Sanctuary. Bookmark the permalink. Leave a comment.